For a little hippo who had such a rough start in life, happiness has arrived - in the form of a tiny rhino. Charlie the hippo was abandoned by his family in South Africa when he was only days old. Tiny and weak, he would have died on his own. So the kind people at the Thula Thula Rhino Orphanage took him in. Given his precarious condition, no one knew if he would pull through. He was peeing through his still-attached umbilical cord, and if it didn't resolve on its own, he might need a very scary surgery. But within days, he was in much better spirits. Here he is with his caretaker, Karen Trendler, on an early morning stroll. But while Charlie recovered, a little white rhino was living her own nightmare. Makhosi was only 2 days old when she was found by the team at Thula Thula. She had been too small and frail to reach her mother's teat, and she would not have survived the night. Fortunately, Thula Thula writes, her mom is still safe in the wild. The team rushed Makhosi into the back of an ambulance so that she could get urgent medical care. "By 3 am the calf wasn't settling and I took a chance and dropped the barrier between rhino and hippo - instant bond and Makhosi settled," Trendler writes on Facebook. Here they are just five minutes after their introduction. 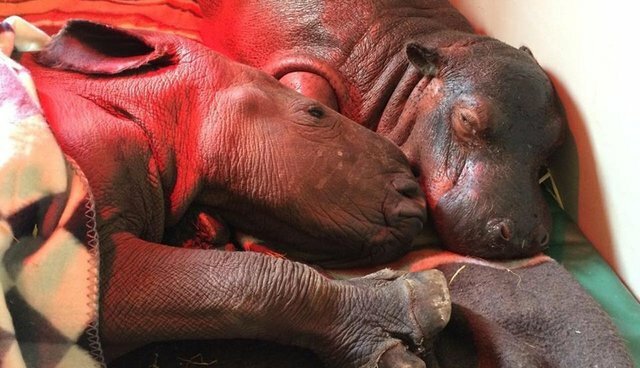 "In a very short time the rhino and hippo calf have become inseparable, providing comfort and company to one another," she writes. "Charlie has really helped to give tiny Makhosi the will to live," Trendler says. These two babies might be different, but hopefully they'll grow up big and strong - together. If you'd like to help animals like Makhosi and Charlie, consider donating to Thula Thula here.